Welcome to Operation Write Home's World Card Making Day Bloghop. It was so much fun looking through all of the OWH sketches and trying to pick my favorite one to use. I finally decided to use two different ones. This is the first thank you card I made using OWH's Sketch #135. Here is the second thank you card I made using OWH Sketch #142. Both cards are quick and easy to make thanks to the Big Shot and punches. I agree with someone who posted that OWH Sketch #142 is a wonderful way to use scraps. Which card do you like the best? Check out the details and supplies for these cards. Beautiful cards! I love the bright colors and love how you added you in the heart. I love your color choice and how bright they are! Wonderful, happy, cheerful cards!!! And I love sketch 135-- I need to use that! Thanks for your support of OWH and our troops! Wonderfully bright happy colors! Great cards! Nice way to use scraps indeed. Love your bright and cheerul colorways. Love your combination of dp with these sketches. Your cards are so vibrant!!! Bright and cheerful cards, and like someone said, a great way to use up scraps. Awesome cards! I love the bright colors and the papers you used for both! Love your cards, they are both so bright and cheery. I really like that Thanks die cut, very fun. Your cards are so cheerful!! Love them! Love both of them, but especially the thanks with the thinlit. Thanks for supporting Operation Write Home and have a great World Card Making Day. I love your paper choices. The colors are so bright and cheerful. Nice to see some really bright and cheerful colors used. I love the bright colors. Your first card is my favorite of the two, but I like both. 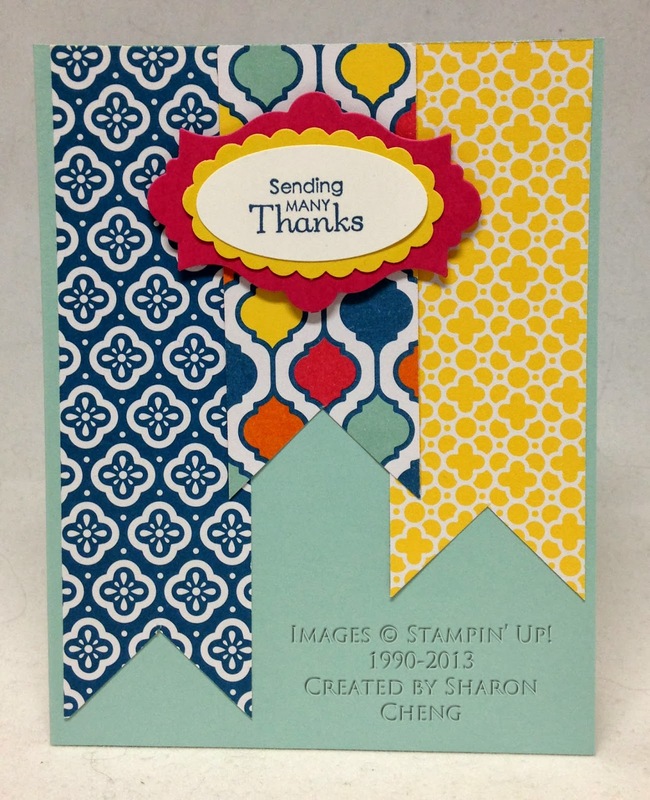 Great cards...love the bright cheerful colors you used! These are such pretty cards. I love the bold colors! I like your card using Sketch #135 because it grabs your attention. What a cute card. The pattern papers are wonderful. Great job. Love these bright and cheerful cards. The heart is the perfect addition. I can't choose a favorite! I love the thinlit sentiment on the 1st one but the punch and framelit layers on the 2nd one is just beautiful. I especially love the yummy colors you chose for the card bases. Thanks so much for sharing your creativity with us! My favorite is the flag card. 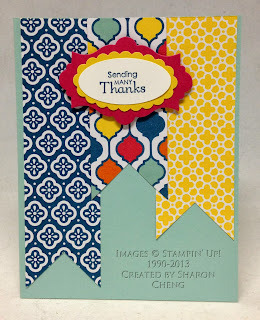 I love using flags in my cards and it is a great way to use scraps. Thanks for supporting OWH! Awesome cards! Perfect way to use up scraps!!! TFS! What bright and happy cards you have created! Both are great interpretations of the sketches and great use of the papers. Thanks so much for sharing! Awesome bright colors. Nice cards. I really like the color combinations on your cards! I'm for anything that will help use up scraps! Thanks for your support of OWH and our Heroes! love the cheery feel to the cards and that these could be made with scraps we all have laying around. I love both the cards you made with both the sketches. Super happy cards, very bright!! Two great cards! I love the combination of papers on the second and it looks wonderful against that blue base. I would have never thought to use that. Glad you were able to join in the hop. Thanks for supporting OWH! Very cute and colorful cards. My fave is the first one. Your cards are bright and cheerful. Super well done! Can't pick a favorite! They are both bright and cheerful, thanks for sharing! Both cards are too cute but I think that big bold sentiment on the first one makes it my favorite! Great work! Happy WCMD! So colorful and great layering of the different punches !